Jake Bartlein joined Boy Scouts as a Webelo in Pack 21 in 4th grade. He was a Webelos Den Chief for six years and is a certified BSA Lifeguard. A photo of Jake climbing Half Dome with Troop 1 was selected for the cover of Boys’ Life magazine in 2010. Jake’s Eagle Scout Project was the design, construction, and installation of a secure, orderly storage system for loose aluminum boat parts (masts and booms) on Santa Barbara Youth Sailing Foundation’s new boat racks. Christopher Helkey was in 1st grade when he joined scouting as a Tiger Scout with Pack 33. His brothers, Daniel, Benjamin, and Matthew are all in scouting as well. In his 12 years in scouting, he has earned every Catholic religious award offered to scouts. Christopher served as a Webelos Den Chief and also taught cooking for a number of years at Cub Scout Day Camp. Christopher’s Eagle Scout project was the production of a promotional video of volunteer interviews to encourage participation with Learning Ally, formerly known as Recording for the Blind & Dyslexic. The video may be viewed online. 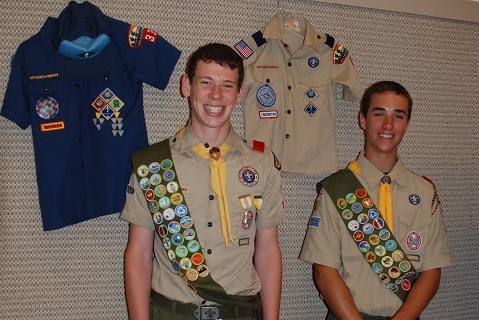 Jake and Christopher were both inducted to the Order of the Arrow, Boy Scouting’s honor society. Jake, a graduate of Laguna Blanca High School, is now studying architecture at Roger Williams University in Bristol, Rhode Island. Christopher, a graduate of Bishop Garcia Diego High School, is studying film production at Loyola Marymount University in Los Angeles.